Summary of today’s show: Fr. 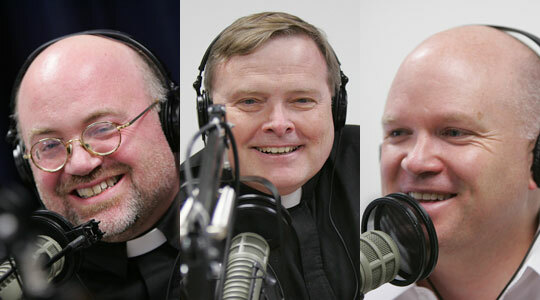 George Evans joins Scot and guest co-host Fr. Chip Hines to discuss his journey to the priesthood and his assignments within the archdiocese with specific focus on his time at St. Julia, Weston, working with a parish merger, and on a pastoral planning commission for the archdiocese. Also, a discussion of this Sunday’s first reading and Gospel from Mass. 1st segment: Scot welcomed Fr. Chip back to show. He is coming in on the tail end of his vacation. He was able to take in a Cape Cod League baseball game and spend time with family. It’s a high level of baseball from Division 1 college players. It’s also a wonderful family experience. Many of the players will end up in the Major Leagues. Fr. George Evans is today’s guest. He’s been involved in archdiocesan pastoral planning efforts in recent years and looks forward to where the archdiocese is going in the next 10 to 15 years. 2nd segment: Scot and Fr. Chip welcome Fr. George Evans to the show.He’s been pastor at St. Julia’s since 2003. Before that he worked for many years at the seminary. He was ordained in 1977 and was assigned to St. James in Wellesley for 4 years, which was a foundation for his priesthood. After that he went to Catholic University of America for 4 years to earn a Doctorate in Sacred Theology. He returned to St. John Seminary as a spiritual director. He helped seminarians to integrate the spiritual life with all areas of their life, but also to be a confidante for the men. He spent 18 years at the seminary and served as interim rector at the seminary for a brief time after Bishop Richard Lennon was reassigned. It was at the time that the college seminary was closed and he worked in 2003 to streamline the seminary’s programs. It readied him to be a pastor. He spent 22 years of his priesthood in academia of one sort or another. His own parish growing up was a key part of his desire to be a priest and he tried to always keep parish ministry at the forefront of his mind. He was also very eager to return to parish ministry after the seminary. Fr. Chip said he thinks he would have gleaned a lot of practical experience at the seminary. He came from St. Catherine of Somerville. Scot said it’s one of the most beautiful parishes we have. Fr. George went to the grammar school there and Matignon High School. He went to Boston College after that. While there he saw the parish adapt to the call of the Church to advance into the modern age. He took the best aspects of that attitude with him to the seminary and then to his own parish. There was a real sense of planning and reflecting among the faculty of the seminary. There was also a lot of newness as new seminarians came in; as they heard many great homilies from other priests; and as he adapted his seminars and courses on a regular basis to keep them new. Fr. Chip said Fr. George’s great strength is the ability to see both sides of an issue, which is why the Cardinal trusts him so and why so many priests go to him as a spiritual director still. Some of his favorite spiritual writers are St. Theresa of Avila, St. John of the Cross, Jean-pierre de Cassaude, St. Therese of Lisieux, St. Benedict, St. Francis of Assisi, and St. Francis de Sales. The latter has a special appeal as a diocesan priest who was working in the Counter-Reformation. He has a love of Church history. It started in grammar school with the Land of Our Lady series, and he became a history major at Boston College. HE taught a history of the Church in Boston at the seminary. It helps him as he works in pastoral planning. A good history of Boston is by Thomas H. O’Connor. More in-depth is the three-volume series by Robert Lord, John Sexton, and Edward Harrington, which goes up to 1944. This gives a good grounding for anyone who wants to talk about the challenges facing the Archdiocese, including discussions of territorial parishes and ethnic parishes. 3rd segment: There are two churches that make up St. Julia’s in Weston. In 2004, during Reconfiguration, St. Joseph Parish in Lincoln would cease to be a parish, but its church building and its territory and parishioners would become part of St. Julia’s Parish. They are one community of people in two church buildings. St. julia was founded in 1919 and the church was built in 1921. St. Joseph was founded in 1900 and the church was built in 1904. It was a mission of St. Bernard in Concord until 1944. Merging parishes is a sacrifice across the board, but it results in a greater good for all. Scot said this is going to become more common across the country, where one priest serves one or more parishes with multiple church buildings. Fr. George said the priest and the parish need to keep their eyes on the parish mission: Word, worship, pastoral care, community building. The parish has to consider its own giftedness or lack of gifts that specify how they need to be right now. In his own parish, people are asked to join commissions in the parish to keep alive various areas like evangelization, religious education, liturgy, communications and others. It’s hard to get all of those commissions strong, but he tries to bring people in from both towns to keep everyone unified. He does his best to make it inclusive. Fr. Chip said when he was in the seminary and remembers visiting St. Julia’s at Christmas time to collect gifts for inner-city kids and the parishes have a long history of charitable works. Both parishes had a long list of charities they contributed to and bringing them all together was sometimes difficult. Scot is struck by how many commissions that St. Julia’s has, more than a dozen, and each one has a unique group of people in it, which is different from many other parishes where the same people are involved in everything. Fr. George said people are very busy and when he gathers people together, they’re gathering busy people. The challenge is to reach out to young families. Back in 2005, Cardinal Seán formed three big commissions: Youth and young adult formation, pastoral planning, and marriage. Fr. George was chair of the pastoral planning commission, whose mission was to understand all the models bishops across the country use to staff parishes. Fr. George said he was not called to consult very much within the archdiocese, but to look outside at the whole United States. They looked at the situation of many dioceses facing demographic shifts, fewer priests, decaying infrastructure, and falling revenues. They looked at all the people in the parish who are so committed to the Church and making parishes strong. Their report to cardinal suggested what we need to be aware of and what needs to be done, including looking at the data and determining how to proceed. Now there is a fuller commission that is looking at more details and consulting more widely about what we need to do here. They are learning from our own experiences in 2004, what was learned in the 2007 report, and what other dioceses have learned. Scot said the first commission put facts into the normal way we think about things in the Archdiocese: How many priests, deacons, religious, etc. will we have in 2020? They introduced the idea of a culture of planning in the archdiocese. Fr. George said the Church as to be a planning Church. We have to be very reflective, not just in the sense of logistical planning, but planning in the sense that the call that we’ve received has to take very definite root amidst resources and lack of them and the realities, including the needs of people and the talents that need to be engendered. The culture of plan has to fill the whole Church from the parish level to the inter-parish level, which is somewhat new, to the diocesan level to the universal level. Fr. Chip said the church isn’t IBM or UPS. We’re dealing with people and their emotions, so when we’re planning we have to account for the emotions, and people’s attachments to particular places. Fr. George said it can’t be just statistics. It has to be about what will help people know, love, and serve God and to do that in a way that will be mission-oriented, in the sense of carrying out Christ’s mission. Scot said parishes need to lead us to heaven and it’s not the buildings that do that. It’s the community of people we sit with in the church or work together with on commissions. It’s much easier when you’re not sitting in an empty church alone. It takes time to plan, which is why we’re looking five to ten years ahead. The title of the 2007 study was “A Church Continually Being Reborn,” in the sense that the Holy Spirit is always creating the Church anew. Christ’s message touches us in ways that help us deal with a changing world. People tend to get interested in the structural side, but the real heart of it is the mission of Christ. 4th segment: Now, as we do every week, we look forward to this coming Sunday’s Mass readings to help us prepare to celebrate together. The LORD appeared to Solomon in a dream at night. but I am a mere youth, not knowing at all how to act. a people so vast that it cannot be numbered or counted. to judge your people and to distinguish right from wrong. The LORD was pleased that Solomon made this request. I do as you requested. and out of joy goes and sells all that he has and buys that field. he goes and sells all that he has and buys it. where there will be wailing and grinding of teeth. Scot said this is the third week in a row that Jesus speaks of the kingdom of God in parables. Fr. George said the kingdom of God is our truest treasure. Sometimes it’s a buried treasure, because we overlook it since we set up other kingdoms. The kingdom is where God’s will for justice, love, peace, morality, commitment, and kindness flow. If we set up the kingdom at the center, then it leads to other decisions that lead to righteousness. Scot loves the questions that are asked by God. He poses a question to Solomon and tells him to ask for something. What would we ask for? Would it be the pearl of great price which is the kingdom or Jesus himself, or would we ask for something more material and limited? Fr. Chip said it’s a good question to pray about. If we ask for what is good from God, which is to be more conformed to his will, then all these other good things flow from that. We have the opportunity to be like Solomon who was able to deal with enemies, with being wealthy or not, and all the rest. Scot said God does ask us to make a choice every day: whether to put his will first in our lives. Fr. George said the contemplative is the one who sees as God sees and loves as God loves. Being holy is seeing with God’s own vision and loving with God’s own heart. The kingdom is a way of approaching life that doesn’t just take like the way it seems to roll along, but lives life differently. Because of Jesus I see this a little bit differently from how I would see or act if I went with my own instinct or went with the crowd. In the parables we see someone who finds a treasure, who sells their possessions to get what they’re looking for. It says to Scot that sometimes we have to give something up in order to get what we really desire, Christ. Maybe it’s to pray more, to give up time or leisure, or shed other parts of ourselves along the way. Fr. Chip said sometimes following Christ means giving up a good thing like marriage for priests. Families make sacrifices all the time for children or spouse. The Christian life mirrors that and following Christ means giving up a good thing and taking on something that might be more of a struggle. Yet Christ is there with us through that struggle. Scot said this Gospel tells him that this is an unfair trade where these people think they’re getting the bargain of the century even giving up everything. You can’t outdo God’s generosity. God gave to Solomon more than Solomon asked. Scot said it also tells him that we also have to understand the road map to bring Jesus into our heart. That’s probably more prayer and receiving Sacraments more frequently and reading the Scriptures more frequently. We need to place our trust in Christ. Fr. Chip said it’s a risk and a leap of faith to trust that Jesus is leading us in the right direction. That’s when we better understand what Christ is calling us to do and be. Fr. George said when we pray we need to make sure our prayer is not just a gift of ourselves to God, but also God being seen as who he is: the one who says I love you or console you or challenge you. When we pray we see Jesus who travels with us.